VVI pacemaker is the most common type of pacemaker. VVI pacemaker is a medical instrument that allows to heart muscle to work properly. In the surgical procedure, a specialist cardiologist, incorporating VVI pacemaker into the chest wall and VVI pacemaker with wires connect to heart in the right upper heart chamber or on the right ventricle. The role of VVI pacemaker is that in the event that a heart is slowing down, or stop, sends an electrical impulse to the right ventricle and activates the heart. Electrical impulses from the right ventricle passes to the left ventricle and thereby runs the blood flow. When the heart is damaged by a heart attack or when heart block occurs, the heart loses it’s role as the natural pacemaker. VVI pacemaker may be needed if conduction between the upper chambers and the ventricles or atria and ventricles is lost. VVI are only the first three letters of the code system of 4,5 or six letters of the coding system. Other letters indicate changes in the VVI pacemaker, depending on the modulation rate or cardiovascular changing demands of the heart. The fifth letter if there is one is related to the function of anti-tachycardia. This type of pacemaker can cause in some patients pacemaker syndrome, particularly in patients with sinoatrial disease more than patients with atrioventricular disease. VVI pacemaker could cause retrograde ventriculoatrial conduction which leads to nausea, low blood pressure and fatigue. Pacemaker syndrome is caused by atrial cannon waves a result of simultaneous atrial and ventricular contractions. blood storing in the pleural cavity and others. After surgery, the patients Vehicle Licensing Agency informs that he has a built VVI pacemaker and therefore they issued him an appropriate driving license. You need to avoid the stress of exercise three to four weeks after installation of VVI pacemaker, after that the patient can continue with most physical activities, but should be careful not to damage the pacemaker. 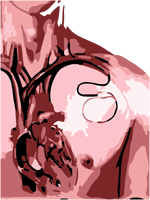 Replacing the battery pacemaker usually goes through the old scar on the chest from the implementation of a pacemaker.